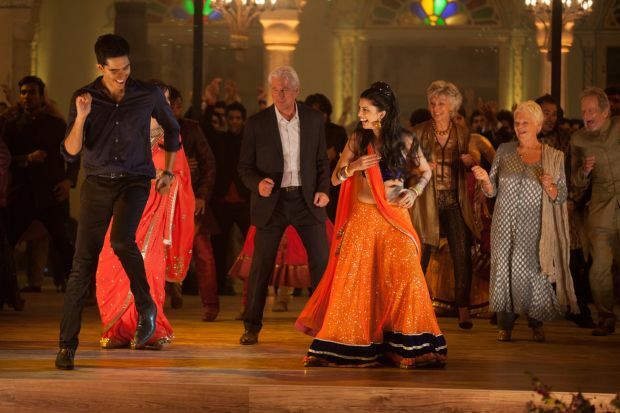 NEW YORK (CNS) — Based on its ingratiating surface, the comedy sequel “The Second Best Exotic Marigold Hotel” (Fox Searchlight) might be categorized as the sort of film that, while safest for adults, could also be appropriate, at a stretch, for well-grounded teens. Closer analysis, however, reveals underlying elements that make director John Madden’s follow-up to his 2012 ensemble piece “The Best Exotic Marigold Hotel” a morally mixed journey not to be undertaken without the passport of a seasoned judgment. In returning to the eccentric Indian hostelry that served as the primary setting for his original movie, Madden doesn’t spare much thought for viewers unfamiliar with that earlier opus. The roll call of guests that makes up a part of the Marigold’s morning routine — and that serves as a precaution against any resident’s death in the night going unnoticed — presents us with, but fails to introduce, repeat characters. Thus newcomers to the story will have to discover for themselves the variety of romantic difficulties besetting the inmates of this innovative — and very pleasant — substitute for an old-age home. Would-be couple Evelyn and Douglas (Judi Dench and Bill Nighy), for example, are too reticent to follow through on their feelings for each other. Recovering lothario Norman (Ronald Pickup) is having difficulty adjusting to his newly exclusive relationship with girlfriend Carol (Diana Hardcastle). So much so, that Norman fears his idle complaints to a local cabbie during an inebriated taxi ride, together with his extravagant overpayment of the fare, may have been mistaken for a request to have his style-cramping companion eliminated. Marriage-minded Madge (Celia Imrie) is spoiled for choice, unable to decide which of her two ardent — and eminently eligible — suitors she should accept. As for Sonny (Dev Patel), the good-hearted young man who shares management duties at the Marigold with sharp-tongued former guest Muriel (Maggie Smith), his preoccupation with expanding their business interferes with the preparations for his wedding to fiancee Sunaina (Tina Desai). His striving for new heights also leads Sonny to decide, impulsively, that self-identified novelist Guy Chambers (Richard Gere) is really the undercover inspector hotel-chain magnate, and potential Marigold investor, Ty Burley (David Strathairn) has dispatched to evaluate the lodging. A vast pool of veteran talent and the appeal of Patel’s grandiloquent patter serve as reliable resources for Madden. But, in drawing once again on material that originated with Deborah Moggach’s 2004 novel “These Foolish Things,” Madden takes unwed liaisons and living arrangements as a given. Ol Parker’s screenplay, moreover, though its dialogue is, for the most part, suitable for teatime, seems to stack the emotional deck against the long-lived, though turbulent, marriage uniting Douglas with acerbic Jean (Penelope Wilton). Douglas would do well, we’re apparently meant to infer, to jettison the unsympathetic Jean in favor of a bright future with Evelyn. The film contains acceptability of divorce, benignly viewed premarital situations, several sexual references, at least one use of profanity and a few crass terms. The Catholic News Service classification is A-III — adults. The Motion Picture Association of America rating is PG — parental guidance suggested. Some material may not be suitable for children.